Where were you fifty years ago this week? Not even born, you say, or just a child, perhaps? Looking back half a century ago, in October 1957, some interesting things were happening. In 1957, Detroit had reached its zenith in automobile design. 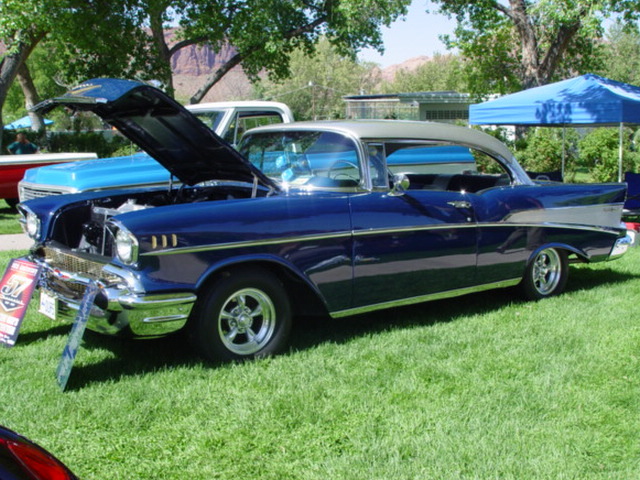 As the model year changed, the ultimate-classic Chevrolet Bel Air Two-door Hardtop was about to give way to the bloated and reviled quad-headlight 1958 Chevy. It was a case of Old Energy (longer, lower, wider; bigger, better, more) trumping the elegance of the smaller, lighter, faster-looking 1957. Everyone wanted the 1957. No one wanted the 1958. American automotive history then started a long march backward that is unchecked today. In addition, that October, we awakened one morning to something called “The Space Race” in the 1950's. The USSR or “The Russians” as we liked to call them had launched the first human-made Earth-orbiting satellite. They gave it the anti-euphonious name Sputnik. We had heard of “Spud Nuts”, but not Sputniks. 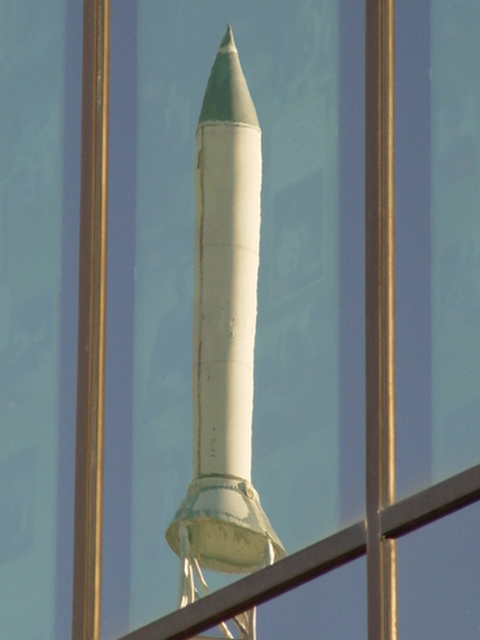 After years of hype about the “Rocket Oldsmobile” and watching spacecraft-like tail fins sprout on U.S. automobiles, the Russians had trumped all of Madison Avenue’s tricks with one rocket launch. Their rocket and its satellite were real. Detroit took several years to fight back. 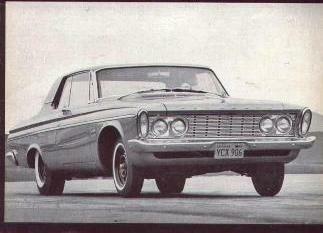 In 1963, Chrysler Corporation named a high-performance version of the Plymouth Belvedere the “Plymouth Satellite”. If the U.S. could not lead in technology, we could at least lead in concept co-option. During the midterm election campaign of 2006, I had the pleasure of visiting the New Mexico Space Museum in Alamogordo, New Mexico. 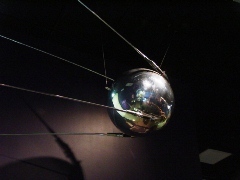 To my great surprise, I discovered a sparkling-clean Sputnik hanging from the ceiling of the museum. Scientists are a clubby lot. It turns out that there were several Sputniks held in reserve by the Russian Space authority. When a former museum director befriended the Russian creator of the Sputnik, the Russian responded by sending one to the Alamogordo museum as a gift. 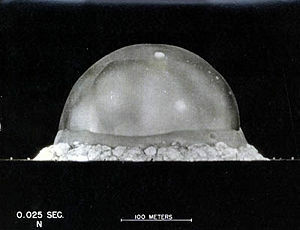 "Trinity” was the code name the project leading to the first U.S. nuclear weapon explosion, which was on July 16, 1945. The "Trinity Site" was located in the remote White Sands Desert, near Alamogordo, New Mexico. Some say that the Space Race was all about intercontinental ballistic missiles and others say it was more about exploration of space, as our “last frontier”. I believe that the truth lies somewhere in-between. Today, it is easy to forget how fearful and inferior the Russians felt as they contemplated the U.S. nuclear weapons arsenal. According to some experts, the U.S. later had the ability to vaporize the Soviet (and perhaps all) civilization at the press of a button. Mutual assured destruction was the term that Henry Kissinger so warmly used. In 1957, however, that first Russian satellite launch gave U.S. residents a Cold War shot of anxiety like none we had ever felt before. After the 1986 Chernobyl nuclear disaster, plant life there often mutated spontaneously, creating some bizarre effects. Looking at the accompanying photo of White Sands plants, do you suppose that the Trinity nuclear blast may have caused these once-small plants grow to their current towering proportions? History can be fun. The U.S. started the “nuclear age” near Alamogordo in 1945. The Russians counter-punched with Sputnik twelve years later. The U.S. hit back hard six years later with the Plymouth Satellite. Meanwhile the Japanese, who were the unlucky recipients of the second U.S. nuclear bomb at Hiroshima, were busy studying automotive technology and design. Biding their time, they later walked away with automotive supremacy. Plymouth is gone. The USSR is gone. Now we are in the “Age of Toyota”. Postscript - English Pravda.ru, October 5, 2007 Headline "Japan - Satellite Reaches Lunar Orbit", a first for an Asian nation.